The reigning Division III champions edge Skidmore in overtime, 2-1. BRUNSWICK — Bowdoin College earned another trip to the NCAA Division III field hockey title semifinals Sunday afternoon, rallying for a 2-1 overtime victory against Skidmore. Rachel Kennedy, the New England Small College Athletic Conference Player of the Year, scored her second goal of the game on a breakaway 11:13 into overtime as the Polar Bears moved a step closer to successfully defending their NCAA championship. In a rematch of last year’s championship game, Bowdoin (18-2) will play Salisbury (Maryland), in the semifinals Saturday in Lexington, Virginia. NESCAC champion Middlebury faces The College of New Jersey in the other semifinal. The winners meet Sunday for the national championship. The Polar Bears are seeking their fifth NCAA title in eight seasons. They’ll be making their eighth trip to the national semifinals since 2005. Kennedy’s ninth game-winning goal of the season came when Bowdoin finally gained possession of the ball after defending six consecutive penalty corners. 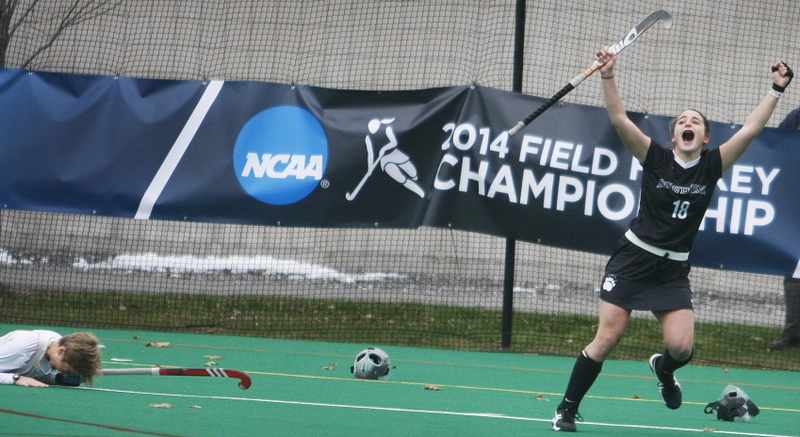 Colleen Finnerty set up the goal by quickly advancing the ball after the sixth penalty corner. Kennedy sprinted with the ball for more than 50 yards before drawing out goalie Amy Beck and sliding a shot into the left side of the goal for her team-high 32nd goal of the season. Despite holding a 26-6 edge in shots, the Polar Bears trailed for most of the game. Skidmore (18-3) opened the scoring less than six minutes into the first half when Krista Lamoreaux turned the Thoroughbreds’ second penalty corner of the game into a goal. Melanie Webb sent a long pass along the left end line across the front of the goal, and Lamoreaux stepped in front of a defender and tipped the ball past goalie Hannah Gartner for her seventh goal of the season. It was only the 10th goal allowed this season by the Polar Bears. Bowdoin held a 6-3 edge in shots during the first half but it was unable to get the ball past Beck, who was credited with 17 saves for the game. Gartner, meanwhile, made a sprawling stop when Sofia San Marco tried to move in from the left side. She also stopped Webb’s blast from 10 yards out to keep Skidmore from adding to its lead. Kennedy tied the score 22 minutes into the second half when she redirected Pam Herter’s centering pass from the left side into the goal. Herter, a senior forward, ran more than 50 yards down the left sidelines with the ball before making the pass.